Isn't it beautiful? I don't have great handwriting, but I will enjoy using this to write quotes in my notebooks and journals, and it will be good for drawing as well. 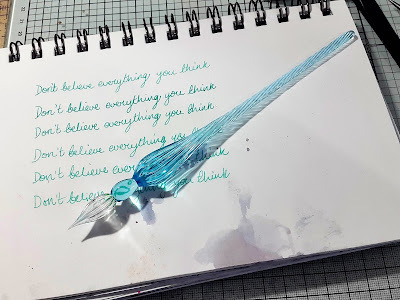 It produces a fairly fine line with no variation in the thickness, so you can't use it in the same way as a flexible metal nib, but it writes smoothly and I wrote all this with just one dip in the ink (using Ph Martin's India ink). You can get them in lots of different colours and designs, I've seen them priced from around £4 upwards, so I am going to collect a few and I'll need a way to store them - may a kind of test tube stand would work?? Thanks for visiting today - thanks to lovely Zsuzsa who I'm hoping will link up for me. I'll catch up with everyone during the course of the next few days. Have a lovely crafty week! That pen has been sitting in my cart since your post two weeks ago! Time to order it! I can't believe you wrote all the with just one dip! I think your handwriting is beautiful and a pen like yours will definitely inspire me to improve mine! 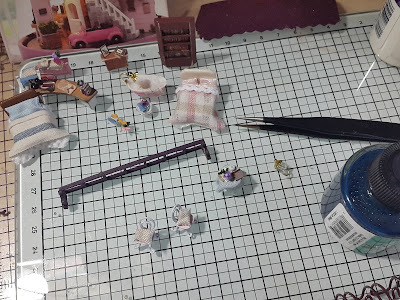 It will be interesting to see what you're building with the miniatures as well! Now I'll go and try to cobble up an WOYWW post as well - running late! I've been distracted by YT this morning LOL! Hi Annie - what a glorious looking pen1 Enjoy. 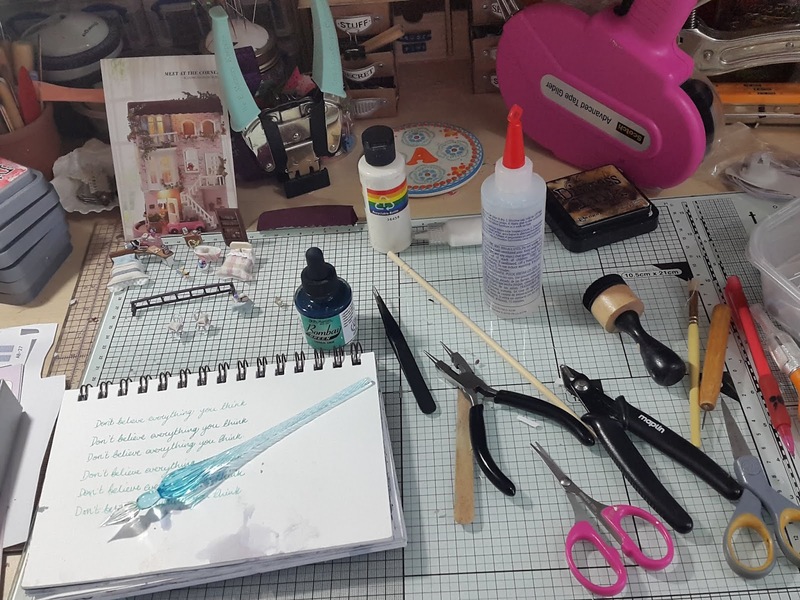 Those miniatures are absolutely stunning - I'm so looking forward to seeing more - you must have incredibly sensitive and delicate hands to make things so beautifully and accurately. Oh WOW, that pen is gorgeous! I love glass and that is my favourite colour so it's win-win for me! You definitely need to get some more in different colours and have them lined up like a mini work of art. I can't believe that you did all that script from one penload! Link you up she did! Love the miniatures but that glass pen. Ooh, it is gorgeous. Something I have often thought I wanted but never got. Great idea to get several and store in a test tube. I have (sadly bits are broken) a test tube thingy that has several that are in a sort of plastic chain so they can be pushed and pulled into different shapes. It is for flowers really. Just thought something like that might be easy if you could find one at a florists. Drooling over that scrumptious pen and you did all that with one dip? Such a pretty colour and I admire you miniatures, but would be hopeless at it myself - just don't have the dexterity anymore. My goodness! - you are working small aren;'t you? I agree with Zsuzsa where your handwriting is concerned. Lovely. And the dip pen is pretty. Looks intriguing. Sorry to be so late. My eyes weren't cooperating yesterday.